Ocean Pointe is a North Myrtle Beach resort that is aptly named because of its fantastic location near the northernmost point in the Cherry Grove section of North Myrtle Beach, South Carolina. This second-row North Myrtle Beach resort is across the street from the beautiful white sandy beaches and directly on the salt marsh channel. The swimming pool of this charming North Myrtle Beach resort faces Ocean Boulevard while on the opposite side of Ocean Pointe that overlooks the salt marsh you will find a dock. This unique North Myrtle Beach vacation setting could be just the experience for which your family is seeking. 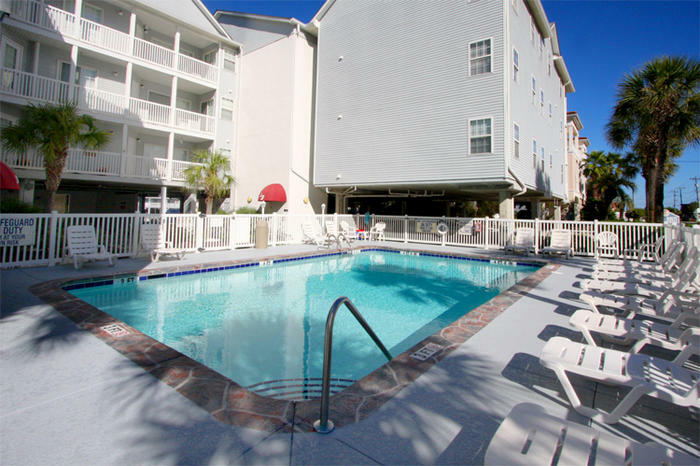 Peruse the North Myrtle Beach vacation rentals offered at this North Myrtle Beach resort and rest assured that the Atlantic Ocean is only steps away from these condos in North Myrtle Beach, South Carolina. This second-row North Myrtle Beach resort is a mid-size destination. Ocean Pointe has three levels of North Myrtle Beach condominiums. An elevator whisks your family and your luggage from the covered parking on the ground level to all three levels of this North Myrtle Beach resort. There are also a couple of centrally located stairways that lead from the top floor of this North Myrtle Beach resort to the pool deck. Each of the North Myrtle Beach vacation rentals at Ocean Pointe has a balcony. Many of these balconies offer a glimpse of the Atlantic Ocean while other balconies have nice views of the salt marsh channel. Relaxing on the furnished balcony of your North Myrtle Beach vacation rental during your beach vacation is a nice way to start and end your North Myrtle Beach vacation day. The North Myrtle Beach condominium rentals at Ocean Pointe are spacious. Choose from an extra-large four-bedroom North Myrtle Beach rental that sleeps 12 or a two-bedroom North Myrtle Beach vacation rental that sleeps six. Both sizes of North Myrtle Beach condominiums at Ocean Pointe feature a nicely furnished kitchen and a comfortable living room with a dining area in between those two spaces. The kitchens of all of these North Myrtle Beach rentals feature full-size appliances, plenty of storage for your snacks and food and even a dishwasher so you don’t have to do dishes during your North Myrtle Beach vacation at Ocean Pointe. The bedrooms in these North Myrtle Beach rentals are as welcoming as the balconies. Relaxation will come easily when you make reservations for Ocean Pointe North Myrtle Beach vacation rentals. You will find wireless Internet access in each of these North Myrtle Beach vacation rentals. There is also at least one DVD player in the North Myrtle Beach condos at Ocean Pointe. These non-smoking North Myrtle Beach rentals also have a washing machine and clothes dryer. Your North Myrtle Beach vacation at this North Myrtle Beach resort will be comfortable and convenient so you can enjoy all that the North Myrtle Beach area has to offer. Elliott Beach Rentals is not affiliated with onsite management or the HOA of Ocean Pointe.